Ask fellow campers about "Timber Ridge Campground" and nearby attractions. $47/day FHU gravel sites with picnic tables Pros Large park in the middle of farms with over 360 sites Sites are very long - plenty of room to park multiple vehicles on site Indoor pool on site 21+ game/puzzle room with electronic slot machines/board games Laundry (1.50 wash/dry) Play areas for kids including volleyball/playground Small camp store - candy/soda/ice cream available Cons It appears a majority of the sites are occupied by full time residences Spotty Verizon cell service (iPhone and Android) WiFi only available at main office "Lake" is really a fishing pond - no swimming allowed Though bathhouses were cleaned daily they were far from "nice" We camped at Timber Ridge Campground in a Motorhome. Best part was the indoor pool except the outside lights were not in working condition. Men's bathroom/shower had drywall falling off the wall and all over. Sites are close together , one shower house/bathroom in pool area rest are flush toilet without sinks . They take cash or checks only. No camp store so don't forget any supplies. The catch and release pond was nice . They do have a basketball hoop and volleyball court but poorly placed by the pond . The playground was pretty outdated. The picture on their website shows a pretty water fall , well it's not on site you have to drive about an hour to get there. That was disappointing. We camped at Timber Ridge Campground in a Tent Trailer. We went to Jamie's flea market. 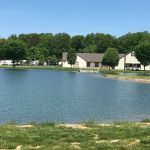 We enjoyed our stay at Timber Ridge and would return if we were just driving through the area and needed a place to park for a night or two. It was easy to navigate the roads and back in to the sites. The indoor pool was nice, and fellow campers were friendly. There was a nice activity schedule and playground. There were good bathrooms and showers at the pool, but the restrooms near the campsites were basically outhouses with plumbed toilets (no sink or showers). Most sites were on grassy fields with no shade or privacy. There are saplings planted, but it will take years before they provide any coverage. Our site had broken glass bottles and trash in the fire pit and an old corn cob on the pad. It clearly wasn't cleaned before we checked in. It was also flooded a bit from a recent storm, and it took a couple days for it to clear. They gave us a gate key, but the gate was always open, even in the middle of the night. There isn't a camp store, and half the games in the game room were broken. There was a nice pavilion for events, though, and a sweet porch with tables and rockers to enjoy. We got the sense that this place was a work in progress, and it will continue to improve because the staff seemed to genuinely care. It was also priced accordingly. We camped at Timber Ridge Campground in a Travel Trailer. We came here because it was halfway between Cedar Point and Cleveland. We enjoyed both! Especially the Cedar Point amusement park and the Rock and Roll Hall of Fame. We stopped by just to spend one night and had a wonderful experience. The office staff was welcoming, kind and informative. Our site was level so set up was quick and easy. We were told that 85% of the occupants are long-term, however, this place did not feel at all like a low-income trailer park. The roads are gravel and very dusty. We were right out in the middle of a field and there was no shade. There was a calendar with activities making if feel like an Escapees type campground. Breakfasts and dinners are offered on some days for only $3.50. Golf carts can be rented for $35 a month. Prices seemed very reasonable. We would definitely stop by again if we were traveling through this area. We camped at Timber Ridge Campground in a Fifth Wheel. We were seasonal for 2 years. Managers were glad to see you when your bill was due, but did little to solve issues with your campsite. The owner might have said 5 sentences to us in two years. If you don't mind dust storms when it is dry or mud puddles when it rains, I guess the roads are bearable until the gravel washes out of the craters. When it is hot and everyone uses their AC, we were lucky to get 95 volts to our trailer, but on a cool day we were doing good at 105 volts. After a while you get used to the smell of raw sewage. The pool was so chlorinated you could smell it 50 ft away from the building and it was enclosed. I met some great people here and when they left, so did I. If the owner cared about this place it has some potential. Lot spacing is very close with sunny/open exposure. Site surface is gravel, featuring a fire ring. We camped at Timber Ridge Campground in a Fifth Wheel. Large level gravel sites. Friendly staff. Great indoor pool. We stayed three nights and it was quiet. WiFi only at office. The only down side is low water pressure. I would definitely stay here again and recommend this campsite. Verizon Cell and data was excellent. Easy satellite. We camped at Timber Ridge Campground in a Fifth Wheel. Great place to visit is Oberlin. Art museum, beautiful campus. Great restaurants. We have camped in Timber Ridge campground for 5 nights. They have friendly staff, nice indoor pool,breakfast and dinner gatherings. Full hookups are are available with 50 amp service. There is a playground and fishing pond. Our complaint about this campground is the dust. I would describe it as a dust bowl. Roads are gravel and whenever cars, trucks, or golf carts go by our unit clouds of dust are created. I have camped in other gravel road camps where you do get some dust but nothing like this. My red jeep is totally white. Owner needs to use some dust control product or pave main road. Some yahoo unloaded a large tractor from his pickup to cut grass around his trailer. With the blade engaged he ran it on the road and created what I would call an atomics cloud of dust. Fortunately his wife came out waving her arms and I can only surmise she gave him common sense lecture. This could be a really nice park if they fix the roads. We camped at Timber Ridge Campground in a Motorhome. Staff was really friendly. Clean enough indoor pool. Restrooms were few and far between, so we didn't make our way to them. I gave this a poor rating due to lack of a picnic table at the site, being in a open field with no shade and what seemed like construction (large piles of gravel, construction equipment with long grass growing around it and large pipes) next to our site. Lots of seasonal and permanent residents. I feel the pictures on the website are misleading, it looks like you will be camping in woods and shows an empty field, the field is now covered with motorhomes and those in the wooded area don't look like they have moved in some time (large built on porches) again everyone was super friendly. Just wasn't the camp grounds I expected from the pictures on the website. We camped at Timber Ridge Campground in a Motorhome. Easy check in. Wooded area is lovely but tight. Our RV fit nicely but larger units will likely not fit. Pool is beautiful and adjacent restroom/changing area was spotless. There are some "shabby" areas (rusty doors on adjacent patio area) that lower the otherwise very positive impact of a beautiful pool area. Playground is Retro Fun. The 1950's may be missing their merry-go-round. My kids had fun. Seasonal sites vary from spotless to a handful of "Sanford and Son." Seemed a very family friendly "quiet" park. There were a number of fun activities planned with- pig roast and karaoke. The park property was nicely mowed and tidy overall. $30/night for full hookup on a pretty wooded site was very reasonable. If we needed to camp in the area we would stay here again. We camped at Timber Ridge Campground in a Fifth Wheel. The biggest drawback to this campground is the round-about hilly road getting to it. The owner is very nice and the campground is undergoing a huge expansion. This would be better as a destination campground than for a one night stop. We camped at Timber Ridge Campground in a Motorhome. Much to my regret I ignored the previous reviews for this campground. The electrical voltage was so bad that we kicked the breaker several times even though we just used one appliance at a time. Don't be fooled by the web site. The campground is chopped out of a hillside. The sites are not level and poorly planned. It was nearly impossible to work our way between all the trees to get to a site that had a 10 inch drop from one end to the other. Other sites I saw had low muddy areas. The clubhouse was junky and had mismatched worn furniture. I will not stay here again. Next time I will park on the exit ramp of a highway rather than stay here. We camped at Timber Ridge Campground in a Motorhome. The managers of the campground were unfriendly and unavailable. We had to call them to get them to let us in when we arrived, as no one was in the office and the gate was closed. 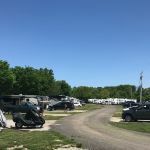 They argued with us upon arrival, claiming that we had booked tent sites rather than RV sites, even though they took info on the length of our trailers and put us down for full hook up. Over the phone I asked about the indoor pool, and they said it was possible that it would be open when we got there. Upon arrival, we asked and they stated to us that the pool never opens until after Mother's Day. The internet advertised our weekend as "Open House Weekend." They claimed there would be hayrides for the kids, and the diner would be open for dinner and breakfast on Saturday and Sunday. None of these things happened while we were there. We will not recommend this campground, nor will we be returning. We camped at Timber Ridge Campground in a Travel Trailer. I suspect the only reason this campground previously got an "8" is that an owner or their affiliate posted the below review. I wish I had noticed this before we stayed here. The reviewer only has 2 reviews, and they are both for this campground. It looks close to the interstate on a map, but actually requires a fair amount of driving on smaller roads. This campground IS NOT lake front. That is a lie; it has a small man-made pond and no sites back up to this either. The gate and entry road are a bit tight. The sites are gravel and required a little leveling. Some buildings are in very poor shape. The dumpsters were overflowing, and the park smelled of garbage and sewer. The little playhouse at the playground was full of trash, and there was trash throughout the park. Most of the surrounding trailers were permanent and had a lot of clutter out front and/or permanent porches full of junk. The electricity box is behind the site and my cord fell just short. Luckily I have a 30AMP extension cord. We got suckered by the bogus review on here; don't let the same happen to you. Look at my review history and the "8" reviewer's history. We camped at Timber Ridge Campground in a Travel Trailer. This campground has such potential, however, I do not see where the new owner has done much. There is a beautiful indoor pool, big screen TV room and a catch and release fishing pond. It is starting to look shabby. No landscaping and the buildings could be maintained better. Our space was very unlevel and had only a thin layer of small gravel. With a 42' motorhome, we quickly started to sink. There were power lines and tree limbs right behind us so it was difficult to back up very far. However, it was our fault that we did not asked to be moved, but I feel that we never should of been placed there. Great campground for adult bicycling and many activities planned. We camped at Timber Ridge Campground in a Motorhome. This park is now called Timber Ridge Campground. It has new owners for three years or more. They have made several improvements to the Campgrounds. The Pool is located inside a huge building with attached shower & changing rooms. New game room has been added and there is a catch & release fishing lake. It's very family friendly. Two playgrounds with swings, slides and sandboxes for fun of all ages. Several seasonal campers here but there is plenty of space for other campers. We camped at Timber Ridge Campground in a Fifth Wheel. 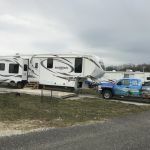 Are you affiliated with Timber Ridge Campground ?